This 18-year old Hypalon white single-ply roof system had been causing the middle school water intrusion problems for the last few years as it began to fail due to punctures, brittleness, and many other problems. The school had reached the original expected lifespan out of this white Hypalon single-ply roof system before it began to leak extensively and require constant maintenance and care. Knowing that it was time to have this middle school building re-roofed before the new school year, the school brought in Triton to analyze their current situation and present the options they could choose from. There were lots of punctures in the existing membrane due to a variety of causes and the school was constantly having it patched. Algae and fungi had also eaten into the membrane causing pinholes. Some of the fasteners had started to protrude through the membrane due to settled insulation from moisture. Lastly, the membrane was very dirty, which negates its energy savings, and thin due to deterioration over time. Water was actually beginning to wick through the reinforcement scrim of the membrane. 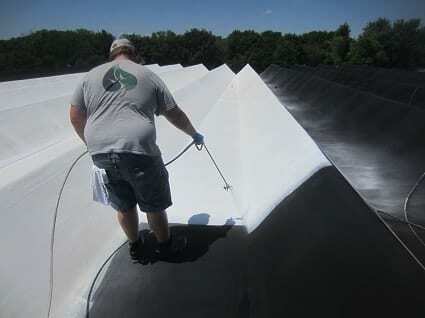 The TRITOflex two-component rubberized membrane was installed in one coat with a spray application directly over the existing single-ply roof system to achieve a 60 mil/1.5mm seamless membrane. It was then top coated with two coats of TRITOtherm thermal insulating coating at 20 mils/0.5mm total to provide superior energy cost savings in the hot summers and also help prevent heat loss through the roof system while the school is heated during the cold Iowa winters. With an industry-leading FM-approved hail resistance classification and leading puncture resistance properties, the flexible TRITOflex membrane will protect this building from anything the elements, roof-top workers, or children may bring at it in the future. The TRITOflex recover system being environmentally safe with no VOC’s, and no harmful or disruptive odors, proved to be the most cost-effective and prudent solution for the school. They can rest assured they will have no disruptions to their vital classroom environments due to a leaking roof and they now have a roof system that can be sustained for decades to come. The school can rest assured they will have no disruptions to their vital classroom enviornments due to a leaking roof and they now have a roof system can be sustained for decades to come.